Four cruise ships are moored off the coast of Grand Cayman. On board the multi-storey floating hotels are thousands of tourists waiting to be ferried across to George Town, the historic capital of the Cayman Islands. Visitors to this British Overseas Territory are a vital part of the economy but unlike many other nations in the Caribbean, tourism is not the only mainstay. The tiny Cayman Islands are the world's fifth biggest financial centre, where hundreds of billions of dollars flow through the economy. But the global economic downturn has put the Cayman Islands and other offshore financial hubs in the spotlight. 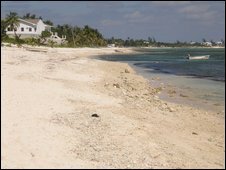 On Thursday, when leaders from 20 of the world's most powerful countries gather in London for a summit, regulation of offshore tax havens will be on the agenda, and that is causing concern on the Cayman Islands. A few streets back from the waterfront and the stores selling duty free Swiss watches, the demographic changes from tourist to financier. The number of flip flops, sarong wraps and shorts start to disappear and are replaced by a more traditional business attire. The people in this part of town resemble bankers working in the City, London's financial centre, or on Wall Street. In the early 1970s, the Cayman Islands tailored its banking regulations to encourage more businesses to move here. The islands' lack of income tax and a bank privacy law have also helped to attract funds. Tens of thousands of companies, hundreds of banks and at least 10,000 investment funds are based in Grand Cayman. "We've developed a really efficient infrastructure that became over time the jurisdiction of choice for hedge funds," says Canover Watson, managing director of Admiral Administration. "Combine that with the law firms, the auditors for an island as small as we are, the talent pool that's here makes it a unique place." It is estimated that up to $11.5 trillion (£8.12 trillion) in assets are held off-shore worldwide. British Prime Minister Gordon Brown has led moves to clamp down on tax havens. Addressing the US Congress earlier in March, he asked: "But how much safer would everybody's savings be if the whole world finally came together to outlaw shadow banking systems and outlaw off-shore tax havens?" Many Caymanians believe that the British government is misguided in its desire to clampdown on their financial sector and should be giving them more support. Others in the sights of the G20, including Switzerland, Austria, Luxembourg, Liechtenstein and Andorra, have in recent weeks relaxed their bank secrecy laws to try and head off trouble before the meeting. Over the years, the Cayman Islands have come under scrutiny about the regulation and oversight of their financial institutions. 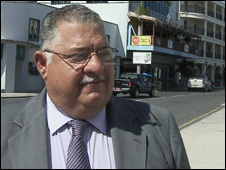 They have tightened up rules to stop money-laundering, a point stressed by the islands' political leader, Kurt Tibbetts. "The Cayman Islands operates a financial services sector that, by any measure against global standards, is regulated, transparent and co-operative," Mr Tibbetts wrote in a recent letter to President Barack Obama. Since 2001, agreements have been in place with the US to pass on tax information, and in recent weeks the Cayman Islands have been busy signing similar deals with many other countries. Ask people in the industry if funny money is still in the Caymans system and most will say there are problems with tax evasion as in any other nation. But islanders say they have been cursed by The Firm, referring to the John Grisham novel turned into a film with Tom Cruise which was partly shot on the island. They say the plot involving mob money did not help the country's image. 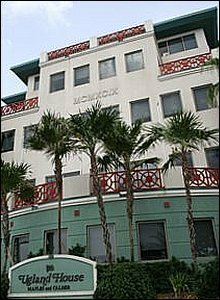 During last year's US presidential campaign, Mr Obama referred to a building in the Cayman Islands that, he said, supposedly housed 12,000 US-based corporations. "That's either the biggest building in the world or the biggest tax scam in the world," he said. The building Mr Obama talked about is Ugland House, the head office of the international law firm Maples and Calder. Situated on the outskirts of Georgetown, it is actually the address of almost 19,000 companies. For some, the building has come to symbolise the drain on the economies of the big nations, a view rejected by the law firm. "Maples and Calder are part of the solution, not part of the problem," says joint managing partner Charles Jennings. Mr Jennings says his company is "especially needed in these difficult times. In fact, we are busy setting up funds for international investors to buy up toxic assets that are gumming up global financial markets." But along with the G20 meeting and the re-introduction of the Stop the Tax Haven Abuse Act by US Senator Carl Levin, a bill originally also sponsored by Mr Obama when he served in the Senate, the current challenges to the off-shore sector could not be clearer. "These times are very different from five years ago or eight years ago or even 10 years ago, in the sense that there's an overwhelming pressure on the governments in those countries to do something very dramatic," says Paul Byles, who owns Focus, a financial consultancy on the island. It is not clear what action the G20 will take but it may cost the Cayman Islands dearly. "The fact is this country is one that doesn't have a lot of resources. We are just sea, sand and sun and our people. Without our financial sector, we'd be in much trouble to survive as a small island nation," said leader of government business Kurt Tibbetts.